By the help of a powerful fan and air ducts in double-walled side panels with air flow vents an optimal air circulation will be achieved. At the same time the proofer achieves an uniform proofing result at all planes. Temperature and humidity are controlled by climate control automatically: The evaporator is equipped with a fixed water connection and automatic regulation of the water supply. The water heater is controlled by a hydrostatic dry protect switch. 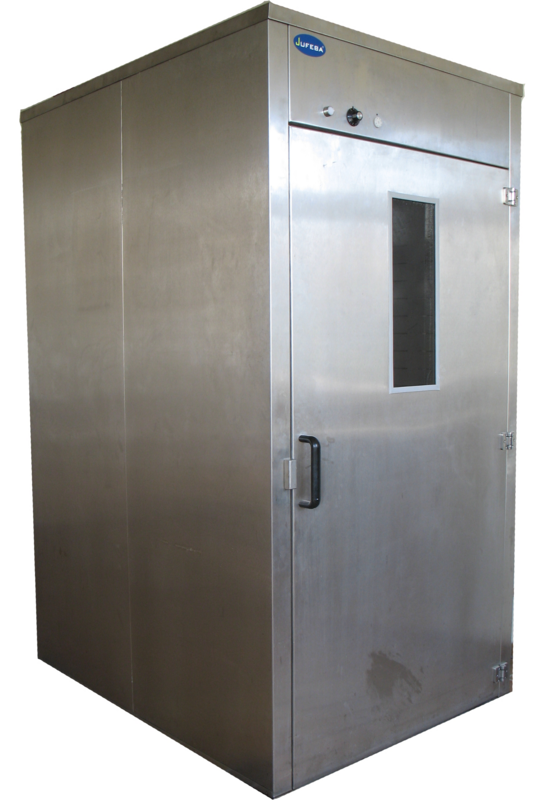 The prover has a separate thermostatically regulated heating and a powerful fan. Proofers for one or more trolleys and for different sizes of trays are available. Proofers are also obtainable without Climate-automatic. Alternatively they are equipped with a thermostatically controlled heater (no fan) with a humidification by a steam bath. Customized features are available on demand. DAll models made out of stainless steel with a double-walled door, a window as well as lighting for the interior. All walls and the door are insulated. All models made out of stainless steel with 4 large castors, 2 of them are equipped with a parking brake. For convenience there are two handles. Inside the proofer is space for 20 trays. Due to the double-walled and insulated doors loading to unloading is very comfortable. The proofing container made out of stainless steel with 4 large castors and two double-walled insulated doors with magnetic doorkeeper. Inside the proofer is space for 10 trays. The coverage is made out of stainless steel underlaid with wood. On request a versions with space for 20 trays is also available.